The government has lifted a recruitment freeze on the judicial services in a development that will allow the recruitment of more than 200 addition staff, it has emerged. The development was revealed by Deputy Chief Justice Elizabeth Gwaunza on Monday as she opened the 2019 legal year in Bulawayo. Justice Gwaunza presided over the event amid demonstrations against the prevailing economic hardships in the country. The ceremony started almost three hours than scheduled due to the protests and was almost cancelled as anti-riot police throw tear gas into the High Court premises. Justice Gwaunza did not make any reference to the unrest, choosing to stick to her prepared speech. She revealed that treasury had allowed the Judicial Services Commission (JSC) to hire 233 staff members. "The treasury has allowed us to recruit 233 staff members," said the deputy chief justice. "Our human capital had been severely depleted by the blanket freeze on recruitment of staff and the authority to recruit was therefore not only timely but also a very necessary intervention." Some 20 magistrates have already been deployed to Bulawayo, Midlands, as well as in the Matebeleland North and South provinces. 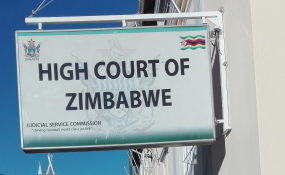 The deputy Chief Justice also revealed that the Bulawayo High Court received more than 4,700 cases during the previous legal year in addition to the already existing backlog. "The station received a consolidated total of 4,785 matters in addition to the existing backlog and completed 4971 matters, thus eating into the backlog carried forward from 2017. "This was despite the fact that the Bulawayo High court dwindled from six judges to four." For its part, the Bulawayo Labour Court received a total of 624 cases in addition to some carried over from 2017 cases made up of appeals, reviews and applications. The Bulawayo magistrates courts received 21,465 cases and 21,486 cases completed, thus reducing the overall backlog in the province. Justice Gwaunza also revealed that the JSC has opened the Plumtree and Beitbridge regional courts.